Newcastle have reportedly made a £6m bid for Napoli and Senegal centre-back, Kalidou Koulibaly, according to Sky Sports. Napoli currently sit second in Serie A, and much of their success can be owed to the performances of Koulibaly who, before joining Napoli two summers ago, plied his trade in Belgium for Genk. A Senegalese international, the defender has plenty of experience despite his relatively young age and his stature and strength is well suited to the rigors of Premier League football (more so than our current lot…). Newcastle have an abundance of talent going forward, yet their deficiencies at the back are evident as 34 goals conceded in 19 games is without doubt the sort of tally which sees a team relegated. Chancel Mbemba, since his arrival last Summer, has admittedly been one of our best players this year. But when partnered alongside the ever-unpredictable Fabricio Coloccini, there is no guarantee that we have things under control. As you can see, Koulibaly has been ever-present this year for Napoli, and has stood out in what is a very impressive squad. Koulibaly is currently tied down to a contract lasting until 2019 – but considering his low stature in the footballing world when he was signed by the Partenopei two Summers ago, his wages are low enough that Newcastle could quite easily tempt him away with a bigger offer. 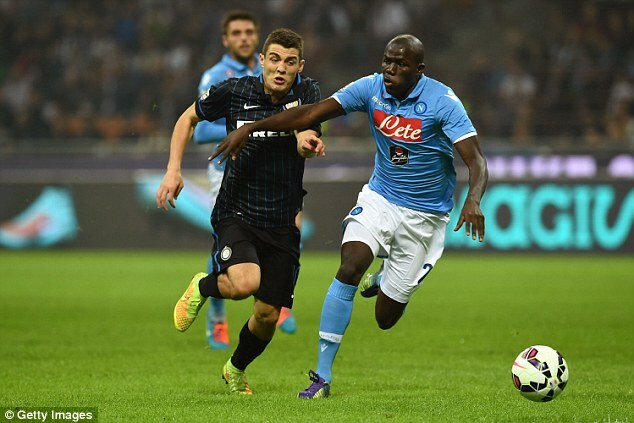 Napoli are already very stocked for centre-backs with both Raul Albiol and Vlad Chiriches on their books. Nonetheless, in recent days, the Italian club have made moves to quash rumours of Koulibaly’s impending departure and have made it known they they wish to keep ahold of him, at least until the end of the season. Wolfsburg, Everton, and Southampton have also been linked with the player in recent weeks and it is likely that, if the rumours of our interest are true, we would face tough competition in attracting him to the Toon. Nonetheless, there is little doubt that Newcastle will be looking to bring in an accomplished CB in January to sure up a very shaky defence, and if we were to prize Koulibaly from Naples, then we would undoubtedly be onto a winner. Well no surprise there then offing pennies again if there serious in plugging this awful defensive gap the should pay proper money 10 million deal done . We will muck about offering pennies in first week of window for unknown players once again we need quality CB / experienced LB / a strong cdm / a qulatiy playmaker who can shot would be good / a proven goal scorer premier league a left winger so Gigi can play where he is supposed to play come on Carr sort this mess out .